High on a Suffolk hill, above everyday concerns, Moat Cottage offers a deafening silence, an unending landscape and an unswerving serenity. 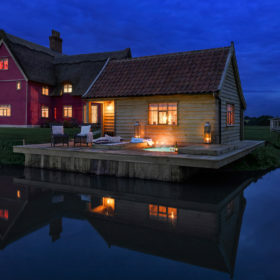 Soak up the steam on the hot tub by your very own moat, fire up a film by the crackling fire, open the doors to the deck and drink in the landscape. Cross the moat over the private bridge. 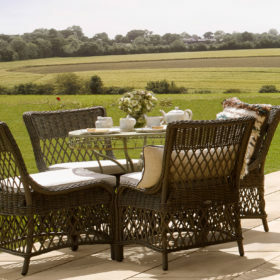 At Moat Cottage, space and time are yours and yours alone to enjoy with the people who matter the most. Here at Suffolk’s Wilderness Reserve, the silence is deafening, the landscape unending and the serenity unswerving. 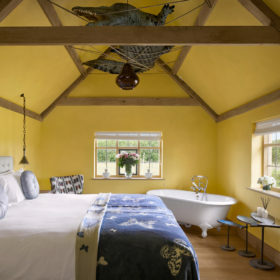 High on a hill, way above everyday concerns, the Moat House sleeps 12 in double-bedroomed, heated-floored supercomfort. But let’s not get ahead of ourselves. A new day dawns at the reserve and there’s a moat to fish and a hot tub to enjoy on the deck of the Huckleberry Finn-type bedroom cabin, and more. Much more. 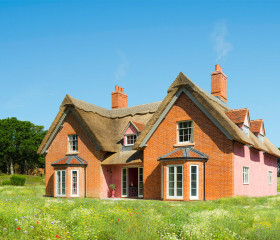 Moat Cottage looks peachy perfect in pink. Open wide the concertina doors to the deck and survey the land for wildlife. 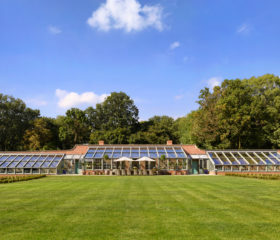 Explore the 4500 acres, bash a ball around the tennis court, row the moat, or get together around the Smart TV for family films by the crackling fire. 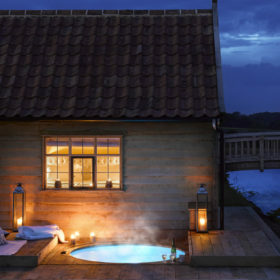 Soak in the steamy heat of the tub on the deck that hangs over the moat, dine in the sunshine on the deck, soak up the silence or gaze at the millions of stars on a clear night. 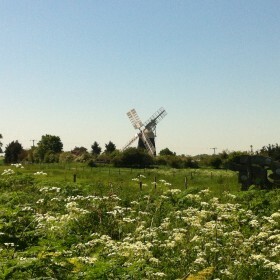 This is a slice of Suffolk that seems to run forever. It’s a 4500-acre wilderness of meadow and woodland and wetland. 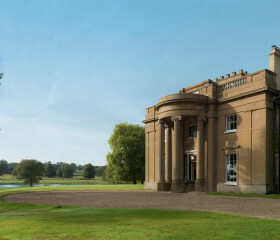 Yet it’s cultivated, too – enough to enjoy bird watching, clay-pigeon shooting, boating or cycling on Pashley bicycles. 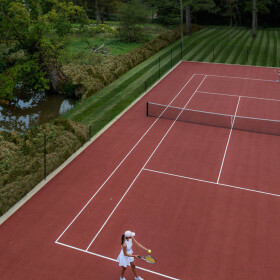 Plunge into the shared outdoor pool or whack some balls around the tennis court. Bring your binoculars and head to the main estate to catch otters slipping in and out of the water, emperor dragonflies, American mink, bank voles and bohemian waxwings, buzzards and brimstone butterflies, bats and brown hares. Back at base, dusk is descending over the moat, dinner is done and dusted, and the deck outside the Huckleberry Finn-like bedroom cabin beckons. 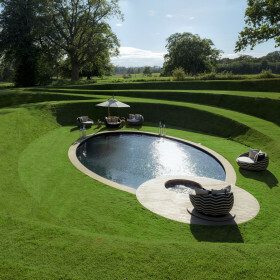 Light the lanterns to cast their glow across the moat and slide into the steamy hot tub. There’s just the still water, the pop of a cork and the flitting of a bat between you and your loved ones. 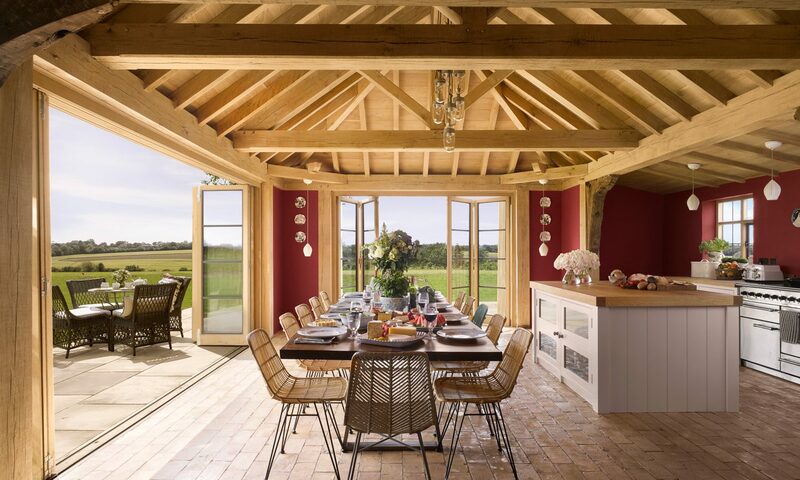 Between the exposed oak beams above and the oak floor below, the spaces here are designed to induce a satisfied feeling of serenity. The L-shaped sofa sits in front of a homely rug. Throw another log on the fire, switch on the Smart TV and get together for a night of Netflix. Living here has an inside-out flow. You’ll want to embrace the space by peeling back the concertina doors. 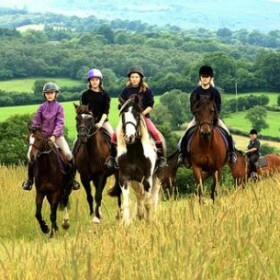 Drift out to the deck, gaze out over the landscape and keep your eyes peeled for neighbouring horses. As the flames create shadows on the walls, you’ll refresh your glass, settle back on the deep sofa and take a deep breath of the pure air that floods in from the reserve. Good living here is as easy as lifting your feet from the heated floor, turning another page and feeling your cares float away. 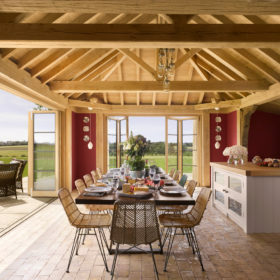 Cook in the clean Suffolk air with the concertina windows drawn back, exposing dual-aspect views across the high plain. 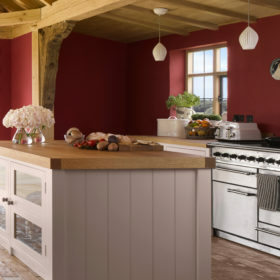 Beneath the exposed beams and the chandelier, you’ll feel at home on the range oven with six induction hobs. Will it be country or continental breakfast? Seasonal dining with fine wine? Maybe a picnic out on the plain by the moat? 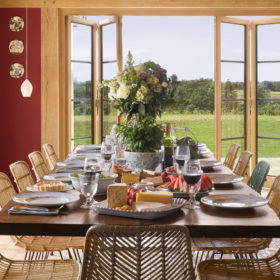 If you’re eating in, there’s room for a dozen around the dining table with the cool air filtering in over the deck. Butter the bread, pour the wine and relax in the restaurant whose clientele is handpicked by you. Dine out in Yoxford on pub grub in the King’s Head, from crab and crayfish to beer-battered cod. 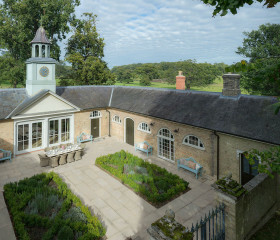 Or try two-rosette Satis House for roasted pork belly or wild mushroom steamed pudding. Main’s Restaurant in Saxmundham’s the place for sea bream with rosemary, chilli and olive oil, or pigeon breast, black pudding and chestnuts. Insomniacs welcome. If you can’t sleep here, you can’t sleep anywhere. 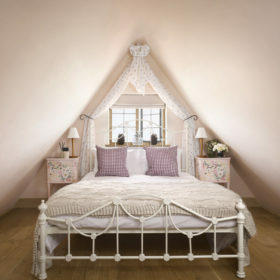 The main house comes equipped with five en-suite double bedrooms, each one a gem and three with deep rolltop baths. 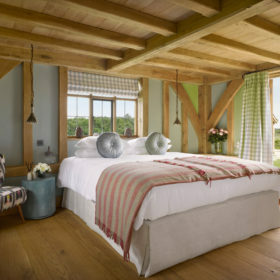 Floors are oak, rugs and throws are cosy, bedding is the softest cotton, cushions abound. 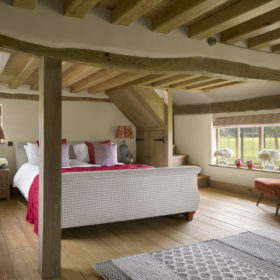 Bedrooms at Moat Cottage mirror a boat, with the wide oak boards and the rolling timber frame. 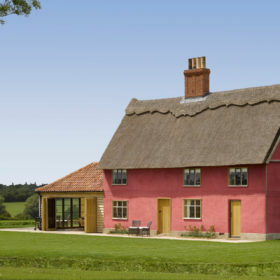 Traditional Suffolk pargetting adds an authentic, homely feel. 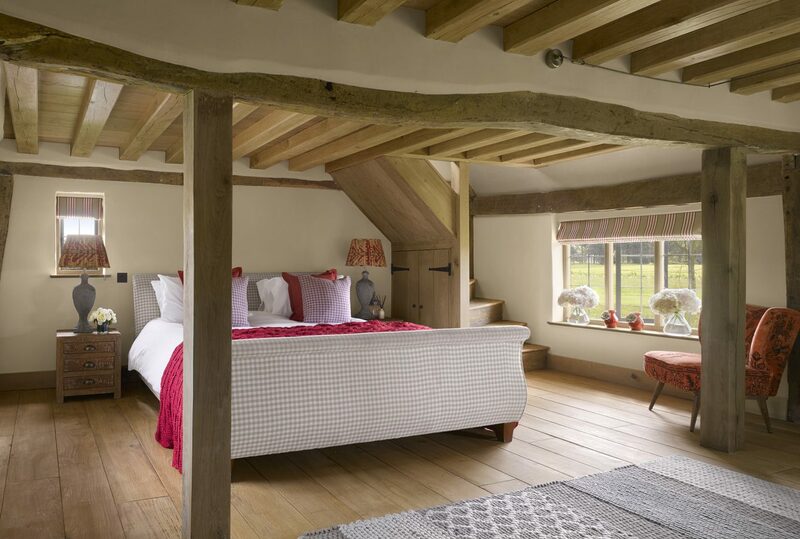 Doze off beneath the Tudor beams with the windows open to the night sounds that drift in off the moat. If you fancy a little privacy, you’ll want first dibs on the bedroom cabin by the water. 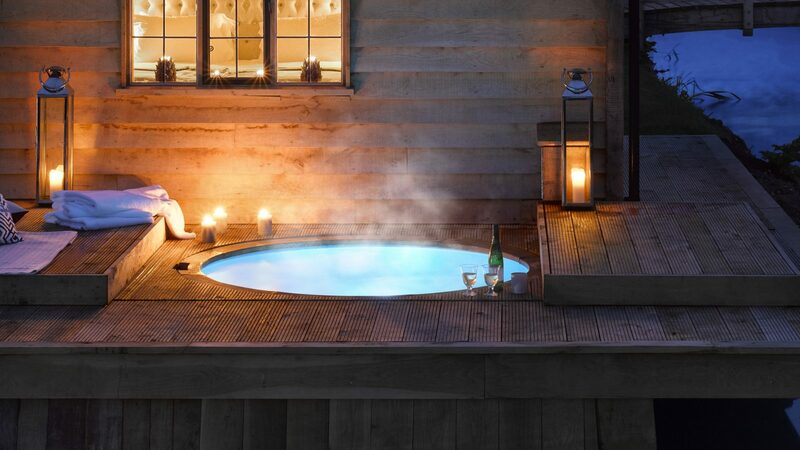 Spend the evening with lanterns and a nightcap in the sunken hot tub on the deck, then go all Huckleberry Finn in the luxury double en-suite. 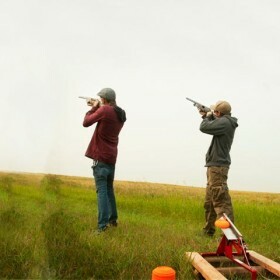 Birdwatching, clay-pigeon shooting, tennis, fishing, swimming, boating and buggying are all possible on site. 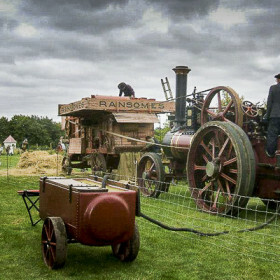 Head out to Dunham Heath and Beach for bucket-and-spade fun among the warblers and woodlarks, take in the tranquility at the RSPB Reserves, or discover theatres, theme parks, science centres and steam trains.